"A man who stands on a hill with mouth open will wait a long time for the roast duck to drop inside it." With these words Confucius advised that if you want to succeed at anything - get on with it! Don't hang about! And that applies equally well to enjoying a good meal, especially one in which traditions play a major part. A culinary institution since 1928, Jimmy's Kitchen Central has all the "comfort" foods that a well-travelled audience desires. Walking down a few steps to enter, the bar/lounge area lies to the left on one side, and a large dining area on the other with various "nooks and crannies" configurations, some more secluded for heart-to-heart revelations and others large enough for family gatherings. Comfort is the underlying theme throughout, and the bar/lounge also has a snack menu ranging from a bowl of fresh mussels steamed in white wine, to a pub-style Ploughman's platter of ham, cheese, pickles etc, and also simple snacks such as breaded mushroom tidbits. The bar has its devotees - it's a very snug and relaxing spot. So much so that it's not uncommon to see lawyer types discussing the finer points over snacks at the bar in the afternoon and find them still there in the evening in the more formal setting of the dining area. The Dining room has rich woods, subdued lighting and burgundy floral carpeting to welcome the diner. The white linen-clad tables are elegantly set with sparkling glass and silverware, and are surrounded by plush couches and padded dining chairs. Tables are set far enough apart to be comfortably self-contained and ensure that conversations are kept private. Dishes range from English Bangers & Mash and Fish n' Chips to Chinese fried rice, and Indian curries - some of which I believe come from Anglo-Indian cuisines - such as Mulligatawny soup, and the chutneys tend to be cooked or sweetened but not too highly spiced. The wine cellar holds more than 400 bottles of wines including rare and eclectic vintages. Apart from an extensive A La Carte, there's The Daily Menu; Monday Coq au Vin and ROSEMARY Leg of Lamb HK$178, Tuesday it's Fish 'n Chips HK$188 or Roast Loin of Pork and so on till Sundays when it's Roast Loin of Pork or Prime Roast Rib of Beef at HK$178-246. It's worth noting that Jimmy's uses a specially designed high temperature broiler (to 650C) to prepare steaks, this gives the meat flavour, moistness, and crust impossible to replicate at home. There's also a Mixed Grill on the menu with a beef steak, lamb cutlet, pork chop, veal liver, sausage and bacon at HK$360. Soups are priced between HK$70-88 and a pasta Carbonara at HK$172. Desserts are what I call "nursery" style winners - scrumptious Banana Splits at HK$88 and a sinfully satisfying Sticky Date Pudding with Butterscotch sauce for a mere HK$66. The wine list has some real gems, a few in the higher price range such as a superb Brut Rose Billecart-Salmon champagne (HK$1,800), and also an excellent Sparkling Pinot Noir (HK$472) from the Bird in Hand winery in the Adelaide Hills of South Australia. Wines are sourced from all over the world from Argentina to Australia, Chile to China, Europe and US. Service is very professionally executed, respectfully caring and friendly. They've all been there for years and treat regulars as one of the family, often having seen customers grow from teens to parents. For many, Jimmy's Kitchen is not just a restaurant to frequent, it's also a place full of memories. NB. 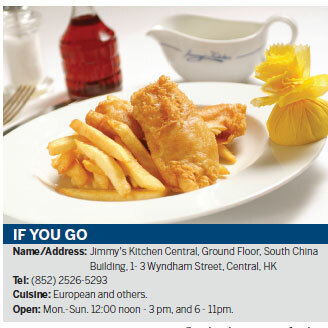 A sister establishment, Jimmy's Kitchen Kowloon, is located on the Ground Floor of the Kowloon Center at 27 Ashley Road, Tsim Sha Tsui. Tel: 2376-0327.